Last fall, one of my closest friends took his own life. I can’t really do him justice with a pithy description, but I do feel compelled to try. He was UX consultant, a poet, a fiction writer. He was probably taller than you. He played the ukulele and liked taking long walks in the rain. He always had a book to recommend, a restaurant I should try, and someone to introduce me to. He was intelligent and thoughtful, wry and kind. We had long discussions about everything from food to fonts, fiction to 4chan. He often helped me rewrite hostile missives into ones that were more socially acceptable. And he walked all around San Francisco with me, meeting up with various people, delivering random gifts to my favorite startups, finding hipster cafes with good cupcakes, and pointing me to the bus I needed to take. 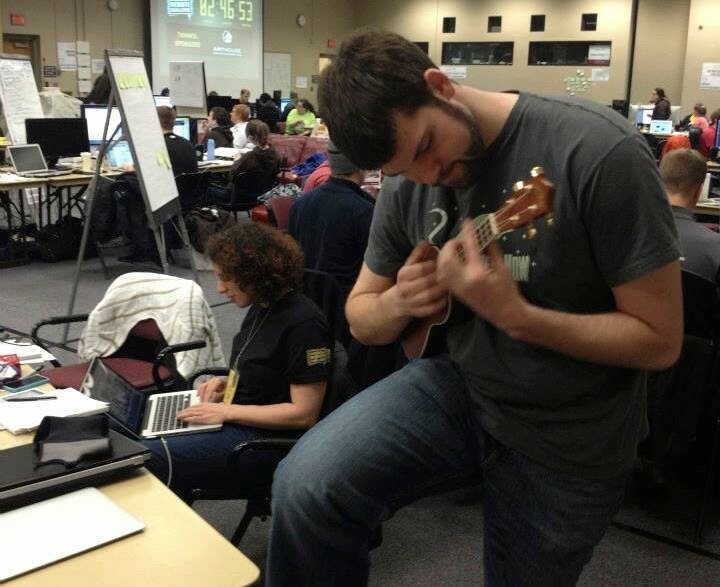 Sam playing the ukulele while I typed away at the Nerdery Overnight Website Challenge in 2013. When someone commits suicide, the classic platitude is to say that there’s nothing anyone could have done. I have really begun to question this. It’s similar, in my mind, to when someone says that any kind of victim who survived a harrowing encounter “did the right thing.” I question this notion. Here’s an example from my personal life. About a decade ago, I woke up one day with a stranger standing over my bed. Luckily, he ran away when I woke up and asked him who he was. Later, I saw that he’d tried and failed to break in through my back door—he’d cut through the flimsy screen with scissors or a knife, and reached his hand through and unlocked the bottom lock, but was unable to get in because I also had a deadbolt. However, I’d absentmindedly left my house keys in the front door, which is how he got in. Was it my fault that someone broke into my home? Absolutely not. Did I “do the right thing” by leaving my keys in the door, as evidenced by me surviving the encounter? Of course not. There are other factors at play as well. Perhaps if I’d made different life choices, I would’ve been living in a safer part of town. Maybe if I didn’t have to drag my bicycle into the house, I would’ve been less likely to forget the keys. Maybe if I lived in a community where neighbors looked out for each other, someone would’ve spotted him. Maybe if the police had gotten there faster when he broke into other homes, he would’ve already been apprehended. Maybe if we lived in a society that handled crime more effectively, he’d have already turned around his life. The list goes on and on. Suffice it to say that many factors could’ve changed what happened. So let’s say that there are factors that can make a home break-in more likely, and ways we can lessen the risk not only for ourselves but also for our neighbors and our communities. Couldn’t this also be the case for helping prevent suicide? I don’t want to blame individuals for what happened to my friend. He was clouded by a fog of depression, and unable to see things as they truly were. There was an accumulation of events, coupled with his state of mind, that made things seem dire. This was not just a single event, but there is a single event I want to focus on. Because I feel that we as a society failed him, and that we can make changes in how we treat people and interact with them that could potentially reduce the types of feelings that lead people to suicide. Sam and I used to chat online every day—sometimes multiple times a dat. This was the last message that he sent me. I didn’t read it until the following day. By the time I responded, I later learned, he was already gone. I’m not sure if everyone can relate to this, but I certainly can. It happens to me all the time. A lot of people don’t invite me to things and don’t try to hide the fact. People often reschedule multiple times, or stand me up. I get ignored at events. I watch people around me having conversations with each other and feel overlooked on a semi-regular basis. People often steal my ideas or repeat them at meetings—and get a much better response. Interestingly enough, I see these very same people have these complaints about other people, ones higher on their totem pole. It’s like this weird platonic love triangle. The person who stood you up got stood up by someone else. That person who was so rude to you may be upset because someone with higher status was rude to them. That means that we should know what it feels like, right? And that’s the other side of this. I am often short with people when I feel like they’re wasting my time, or when they don’t resonate with me. I have no trouble setting clear, strong boundaries. Often this is necessary—you know, like when you wake up in your own bed and realize that some dude’s broken into your home. But sometimes, it’s just not. For example, if I decide not to invite a coworker to hang out, I would like to think that I wouldn’t discuss these plans in front of him as if he were invisible. How about a little empathy? It would be grossly inappropriate for me to tell people they have to spend time with people they don’t like. Forcing social interactions is not a solution. At the same time, we know from studies on solitary confinement—to take this to an extreme—that human contact is absolutely necessary for people. If people knew that inviting a coworker to lunch or a happy hour—even if he’s a little bit sulky—could make a huge difference in that person’s life, how many people would refuse? And what about that person you do like? I think people don’t realize how much they mean to others. That person in your meet-up group who you kinda want to hang out with, but aren’t sure they’d be down? It’s possible that they have nobody to talk to outside of the somewhat forced interaction of your group. You could reframe their entire construct of the world by just taking a bit of a risk—assuming you’re emotionally resilient enough to handle the possibility of rejection. When I invited Sam to my wedding, he asked me if I actually wanted him to come or was just being nice. I reminded him that I was terrible at being fake nice. He realized I was being genuine, and came to the wedding, which was about three months before his death. It was the last time I ever saw him. If he had any idea how much of a void so many of us feel with his absence, or how big of a difference he’d made in so many people’s lives, he may still be here. Perhaps we should’ve made it more clear to him. Perhaps the people he had everyday contact with should’ve let him know as well. When someone is suicidal, the oft-repeated advice is to tell them that they should talk to someone or see a therapist. Sam was seeing a therapist. And he talked to me about his depression on a regular basis. Ultimately, I couldn’t hold space for so much sadness. I told him at one point that he could only complain about three things a day. I used his constant stream of sadness as an excuse to indulge in my own. I think he was better at being there for me than I was for him. It’s impossible to know for certain if anything anyone had done could have helped Sam, if shifting the environment around him to one that was more welcoming and inclusive was all he needed. In any case, I do believe that we as human beings have a choice. We can be stuck in our own heads and our own egos, focusing only on impressing others, and perhaps in the process creating a backdrop in which someone else’s depression grows. Or we can reach out to people, even if they’re a bit shy or awkward or can do nothing for us, and show them that they’re valuable anyway—in the process, chipping away at their depression or false view of the world. I can’t really explain how potent this loss is to me. I miss Sam every single day. Whenever something good happens, I wish he was around to share it with. Whenever something bad happens, I long for his perspective. Some days I don’t even want to go online because he won’t be there, making silly jokes and adding bite-sized insight to any topic that comes up. I don’t know if this will ever change. If there’s anything that we can take away from this, I hope that it’s to have a little bit more empathy, especially to people you may not think belong. Maybe that guy at your GLBT meet-up is genderqueer and needs a lot of support, rather than being a straight dude trying to infiltrate or take over or co-opt your event. Maybe that person who’s quiet and kinda shy has been eating every meal alone for months and needs someone to talk to. Maybe that person you’re using for free development would love to get coffee or drinks with you, and the rockstar investor you’re dying to meet is booked for months and wouldn’t remember you anyway. We’re all busy and have grandiose plans, and many of us are trying to grow our businesses or make a name for ourselves. Reaching out to the people we really admire is of course a higher priority than extending a helping hand to someone we don’t really know all that well. But sometimes doing so can make a huge impact on their lives, and maybe, just maybe, people in fragile emotional states will stick around a little bit longer…until something else turns around for them. And that can make all the difference in the world.